Foam Board/Sturdy Board/Foam Core /FoamX / Foamcore is available. Foam board is an extruded Polystyrene foam between two sheets of white clay coated paper. Because of its light weight, durability, flatness, rigidity, structural strength and moisture resistance, foam board has a wide variety of uses including picture frame backing, dry mounting, vac-u-press wet mounting, etc. Caution: Foam board with white clay coated paper is slightly acidic, having a pH range of 6.5-7.0.
with flame retardant additives in the foam center and in the paper facers. The polystyrene foam center is UL® classified, R4712N and the specially formulated flame resistant facers meet TAPPI T4610M-94 standards. Archival Acid-Free Foam Board provides a standard buffered acid-free surface with a chemically inert core for mounting artwork, photographs, and important documents. The facing paper on both sides of the foam board has a pH between 7.7 and 8.5 and is buffered. Archival Acid free foam board was designed to meet specific conservation standards for preserving works of art. Acid free foam board can be used for mounting large artwork, archival frame backing and creating large format storage folders. The extruded Polystyrene core is laminated between two sheets of warm white acid free barrier paper. Art Care acid-free foam board made with Micro Chamber molecular traps. The Micro Chamber products incorporated in this board effectively remove many harmful compounds such as phenols, ethanoic and methanoic acid, sulfur dioxide, ammonia, and formaldehyde. Covering material on the white foam board is off white and buffered. Black-On-Black foam board is black through the core so there's never a need to color, cover, or disguise the edges. No matter how you cut it the edges remain smooth, flawless and solid black. Black-On-Black is available in 3/16" and 1/2" thickness and a full range of sheet sizes. Single-Step Single-Step foam board has been pre coated on one side with a heat-activated adhesive. The heat and pressure of a dry mounting press activate the adhesive coating forming a smooth, permanent bond. Quick Stik board has a pressure-sensitive adhesive surface on one side for mounting virtually any type of art work, providing a good alternative to messy sprays. Our Shipping centers are conveniently located throughout North America/Canada. Truck orders will start @ $129.00 & up on 4X8ft sheets. $159.00 on 10ft lengths. Note: sizes 32" X 48" X 6" and under can ship UPS / Fedex/UPS starting @ $49.00. Call for Quote. Locations [USA] [CANADA] For Canadian orders: Use the prices in US dollars. 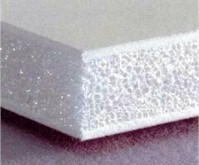 Core: White, fine celled, extruded polystyrene Reval foam board with memory. BLACK on BLACK Foam board It features the darkest, smoothest black paper, bonded front and back to a core of black polystyrene foam. It has incredible depth and richness of color - and there's no need to cover or disguise cut edges because this Form board is solid black through and through. LitePrint FR is manufactured with flame resistant paper and our Reveal® foam center. It is ideal for trade shows, exhibitions, and other public assemblies where local fire codes stipulate the use of flame resistant foamboard. LitePrint FR will NOT continue to burn once the source of the fire is removed. This product is designed to resist ignition and combustion. LitePrint FR delivers safety without sacrificing quality; it is excellent for die cutting, screen printing, digital printing, and mounting. The flame resistant treated paper meets TAPPI T4610M-94 and UL classification R4712N. LitePrint FR meets the minimum requirements of flame resistant established by the California State Fire Marshall for products identified in Section 13115, California Health and Safety Code. Registration No. F47601.